Fool – A jester; a person whose role was to entertain a sovereign and the court. The cats were surprisingly sensitive to being laughed at. They did not like to be the fool for us. You can tell the kitten is still young in this one – the last of my three babies – when he got older, he would have never stood to be wrapped up like one of the Christmas presents. Word for tomorrow – GRAB. If you prefer to work ahead, see the list for the week under “A Word A Day”. Cats are great! Always so involved in family gatherings of any kind. 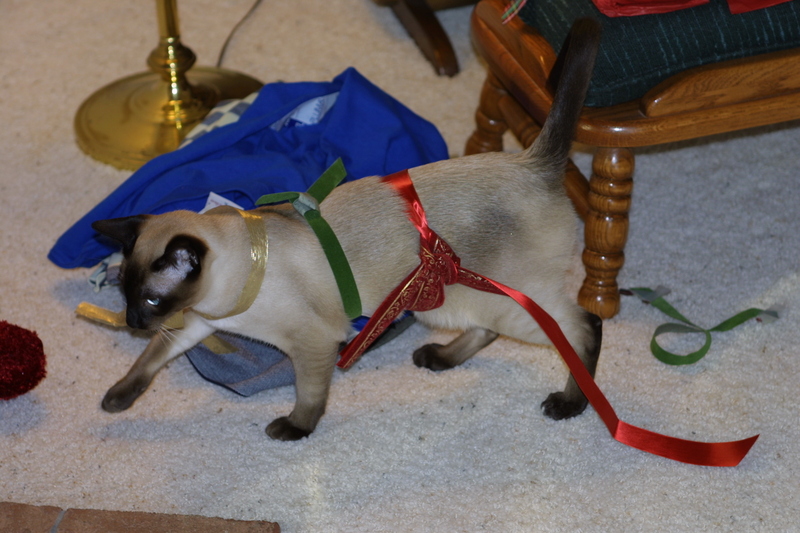 When my daughter was in high school, each time her friends came over and congregated in the foyer, the Siamese ran to be the center of attention. They got all kinds of oohs and aahs and loved it all. I don’t think there’s any way to KEEP them out of family gatherings. They’re wayyyyy too nosy.